From left to right: Edward Hardy, Chief Executive, Considerate Constructors Scheme with Mark Noonan, Industry Relations Director, CITB. 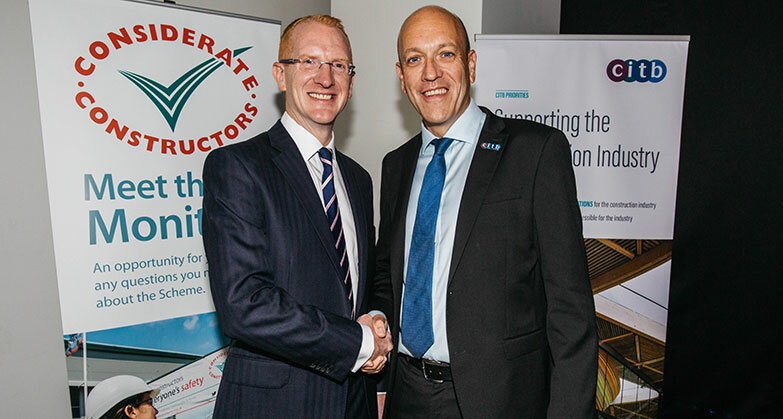 The Considerate Constructors Scheme and the Construction Industry Training Board (CITB) have joined forces in a milestone partnership. The partnership agreement creates a shared action plan to work with construction businesses across England, Scotland and Wales to improve the image of the sector. One of the first activities will be CITB sharing its Go Construct resources with over 9000 Scheme-registered projects across the UK, enabling sites to actively promote their career opportunities to a broader range of candidates. Collaborating on new research to understand perceptions of the industry and recruitment needs for different entrant groups. Creating joint networks of construction businesses to showcase the range of career opportunities for all. Reaching out directly to potential new entrants to raise the profile of construction and what it can offer. This is a landmark agreement and one that is critical to help us overcome outdated perceptions of construction and promote the wide range of opportunities it can offer. We want young people to see that you can have a great career working in construction. Together with the Considerate Constructors Scheme, we will support industry to attract, train and maintain the new wave of highly-skilled talent this sector needs. This Partnership signifies how two organisations which have the reach and influence across our industry can work together to help promote construction as an exciting, interesting and rewarding place to work. Our partnership compliments the Scheme’s work it is already doing to encourage construction to promote itself through its Promoting Constructing #loveconstruction campaign. We look forward to working more closely with CITB to really help the industry to ‘sell itself’ effectively to attract and retain our future workforce.